You can make your booking via telephone, email or Facebook. We have limited sessions available each week - you can choose either a Thursday evening, Friday or Saturday session. Upon securing your session we will discuss the style of shoot you are after and guide you through what you will need to bring along. Your appointment will be confirmed beforehand via SMS and you will be sent details on how to find the studio. It's important that you arrive on time for your session and that your dog arrives on a lead. Once you are in the studio we incite you to take your pet off lead and give them an opportunity to explore the space - Don't worry if there is a little accident, this is all very normal! 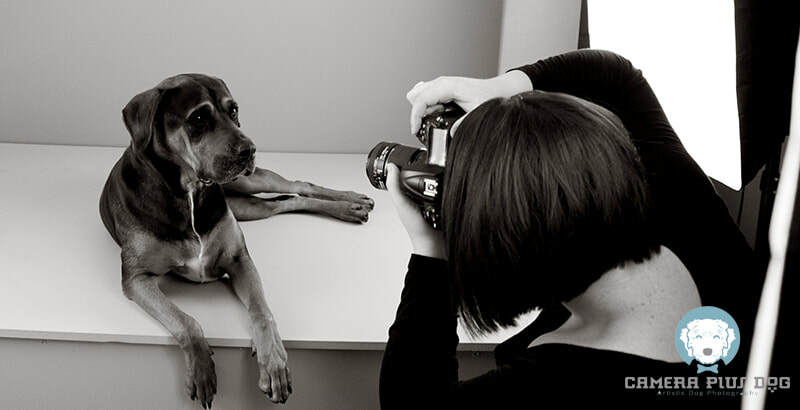 Your photographer will allow the dog to investigate and follow it's cues and body language to gauge when it may be ready to commence the session. With lots of positive reinforcement, we will have you lift your dog onto our raised photography platform and commence photography. We have a variety of posing aids and props in the studio however if you have a specific theme in mind for your shoot it's important you bring along the things necessary to achieve the look you are after. We have limited space in the studio - for his reason we ask that no more than TWO people attend the session - this also ensures we get the best from the pet. Although we love kids, we have noticed they get a little over excited in the space which causes distraction for the dog, for this reason we do request you make arrangements to leave them at home. For your convenience, there is no need to wait around after your session while we prepare your images for viewing. We will make a start on these as soon as you leave, once completed we will create your very own personalised gallery with password access. The software we use makes it easy to select your favourite and we are electronically notified once this has taken place. Although we often get the gallery sent to you the same day as your photoshoot, we do ask you to allow up to 48 hours. It's easy to choose your favourites in our online software. Once you have placed your order an invoice is electronically generated and editing will commence. Each photograph is edited by hand and then made available for you as an electronic download in your private gallery - for a small fee we can also post the same files to you on a quality USB drive. We have made the process so simple, there is no need to worry about collecting orders!